Amber: Thank you so much for stopping by Bibliophilia, Please again for your newest book! Please tell us what has been going on since your last stop? Sarah Beth Durst: Lots of writing! I've pretty much pared down my life these days to (1) writing and (2) spending time with my family. Also eating. And sleeping. And last weekend I watched too many episodes of Tiny House Hunters because I simply cannot imagine my book collection ever fitting in a house like that and I was fascinated. But I'm counting that as "spending time with my family" because I didn't watch alone. Amber: What should we know about your new book, The Girl Who Could Not Dream? Sarah Beth Durst: It's about a girl whose family owns a secret dream shop where they buy, bottle, and sell dreams, and the adventure she and her best friend -- a loyal and cupcake-loving monster named Monster -- go on when someone starts kidnapping dreamers. Amber: How was writing a Middle Grade book like The Girl Who Could Not Dream compare to writing a Young/Adult novel like The Lost or Chasing Power? Does writing in a different age group give you time to recharge, or do you just have so many ideas running around that you needed to do something a little different? Sarah Beth Durst: Honestly? There's not much difference writing for different age groups. You're just seeing the world through a younger set of eyes. I don't "dumb down" my writing; I just change my worldview, and that change yields a different result. I've always wanted to write fantasy -- whether it's MG, YA, or adult just depends on what age protagonist fits the story best. For example, with The Girl Who Could Not Dream, Sophie is embarking on her very first adventure. She's on her own for the first time, making her first new friends, and learning about her own strengths. It made sense to make her twelve years old. Amber: Can you give us any sneak-peak details on The Queen of Blood, which is set to come out in 2016? Sarah Beth Durst: Yes! The Queen of Blood is the first book in an epic fantasy trilogy, and it's set in a world full of nature spirits. But we're not talking sweet, frolicking nature spirits. No, these spirits want to kill all humans, and only a few women have the power to command and control them. These women become queens -- or die trying. As to my favorite book that I've written... I love all of them for different reasons. But I really did love writing The Girl Who Could Not Dream. I think Monster is my favorite character that I've ever created. Usually I develop my characters over many drafts, but Monster... I knew his voice from the very first draft of the very first scene. Amber: The last time we chatted, you said that Star Wars was your favorite movie. How do you feel about the new ones coming out? I'm torn between excitement about all of the new awesome Star Wars stuff that is cool again, and apprehensive that these will be disappointing like the last trilogy. Sarah Beth Durst: So excited!!!!!!!!!!!!!!!!!! I am not remotely apprehensive, in part because I love all things Star Wars and in part because I believe it can't possibly be as bad as that scene from Attack of the Clones in which Anakin and Amidala rolled around in a meadow filled with giant grazing pigs. Amber: Even though you are a traditionally published author with a major publishing company, you have approached us personally with review requests, and you are pretty active on Twitter. What made you decide to get more personal with your fans and pursue the treacherous social media jungle? Sarah Beth Durst: This is actually one of the best parts about being published in this day and age. I get so many lovely emails from people who have welcomed my characters into their heads and hearts. Amber: Am I going to be so sad after reading The Girl Who Could Not Dream that I can't have a little pet monster of my very own? Sarah Beth Durst: Everyone should have their own Monster!!! I have loved Sarah Beth Durst’s particular brand of magical realism so I was excited when she offered us the chance to review her latest Middle Grade novel. I was even more excited when I saw it was about a pet monster (named, Monster, of course) and a girl who can bring dreams and nightmares into life. I was not disappointed with The Girl Who Could Not Dream. Not only is it a great Middle Grade novel, but it’s clever and almost too cute to bear. The cast of characters, both in the waking world and the dream world, were awesome. I am still really sad that I cannot dream up my own pet monster. Also, I want a sarcastic glittery unicorn/pegasus who flies; he was probably my favorite character in the whole book. There are also ninja bunnies, yes ninja bunnies, and they are just as insanely cute and fantastic as you think they could be. 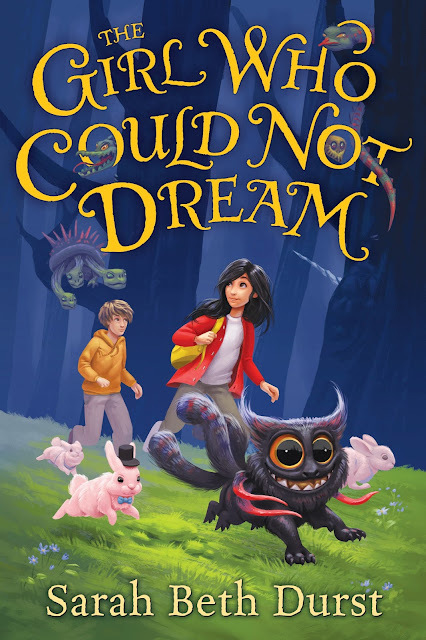 With both Monster’s and the unicorn’s humor and the crazy amount of cute mixed with some creatures that could only be found in a person’s nightmare, The Girl Who Could Not Dream will bring a smile to anyone’s face whether they are middle grade, adult or somewhere in between. I have never read a book with a premise like The Girl Who Could Not Dream, although Durst did use a lot of the typical fantasy tropes, but turned them on their heads with references to much-adored current and past fantasy heavey-hitters like My Little Pony and Harry Potter. One of Durst’s most amazing talents is writing books with ideas that seem so absurd (like ninja bunnies and pet monsters), but have other things that are so real and relatable. While Sophie’s one desire is not something most people would overly long for, the fact that Sophie is a child who believes that other children have something she can never have (dreams) which makes her feel isolated at school is completely relatable to probably almost anyone, child or adult. I wish there were more magical realism novels like The Girl Who Could Not Dream and Neil Gaiman’s The Graveyard Book when I was growing up. I guess I will have to settle for reading them now and acting like I am still not a grown-up. :) I would recommend like The Girl Who Could Not Dream to anyone who appreciates absurd and absurdly cute books that may induce laughs and smiles during the whole book - if a sarcastic sparkly pegasus/unicorn that farts rainbows does not make you smile, your grumpiness may be relieved by reading this book. Sarah Beth Durst is the author of ten fantasy novels for children, teens, and adults, including Conjured, Vessel, Drink Slay Love, Enchanted Ivy, Ice, Out of the Wild, and Into the Wild. Her latest middle grade novel, The Girl Who Could Not Dream, came out in November 2015 from HMH/Clarion Books, and her next novel for adults, The Queen of Blood, comes out in fall 2016 from Harper Voyager. 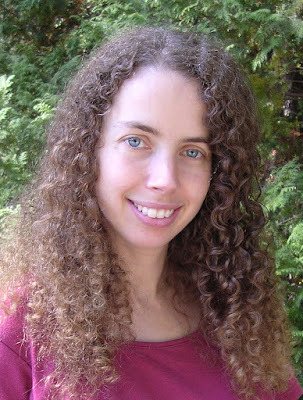 Sarah was awarded the Mythopoeic Fantasy Award for Children's Literature and has been a finalist for SFWA's Andre Norton Award three times. Sarah was born in Northboro, Massachusetts, a small town that later became the setting for her debut novel. At the age of ten, she decided she wanted to be a writer. (Before that, she wanted to be Wonder Woman, except with real flying ability instead of an invisible jet. She also would have accepted a career as a unicorn princess.) And she began writing fantasy stories. She attended Princeton University, where she spent four years studying English, writing about dragons, and wondering what the campus gargoyles would say if they could talk. Sarah lives in Stony Brook, New York, with her husband, her children, and her ill-mannered cat. To satisfy FTC guidelines, I am disclosing that I received an advance copy of the book from the author through Netgalley in exchange for an honest review.